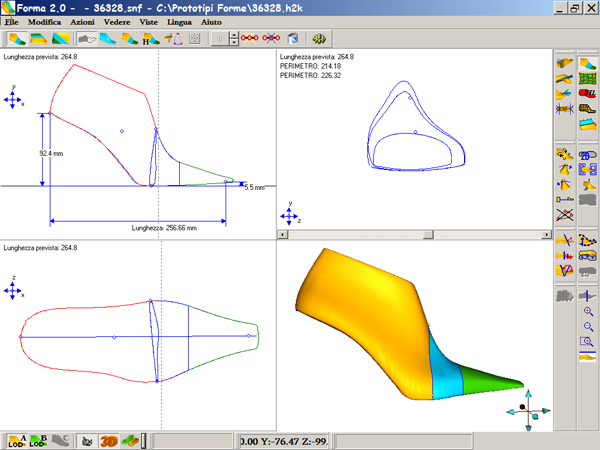 Shoemaster Forma is the leading last modelling system, enabling a wide range of changes to be made to the shape of a last with the minimum of time and effort. Powerful visual modelling tools allow the last maker to sculpt or combine lasts to create any shape they require. The amended last can then be instantly checked for correct dimensions and graded according to user-defined rules. The final results can be milled on a wide range of CNC milling machinery. Shoemaster Forma allows the skilled last maker to perform every function within the CAD environment that they would normally do manually. It's speed and accuracy, however, is far ahead of any manual process. For the less skilled, Forma greatly simplifies conventional manual tasks, bringing them within the capability of a far wider range of personnel. Shoemaster Forma also integrates fully with the Shoemaster shoe design and pattern engineering systems. This means that lasts can be instantly transferred digitally from the last maker to the shoe designer and manufacturer, vastly speeding up the production process and capitalising on all the advantages of 3D CAD/CAM.